You won’t find any products or services on my blog that I don’t either currently use or have used and would recommend. What I did was construct a Motif of all 30 stocks in the Dow Jones Industrial Average and weighted them accordingly with their current weights. I do own some of these companies already but there are a lot on the list that I don’t own. The entire purchase of 30 stocks cost me just $9.95! However, since I funded my account with $2k and have made one trade, I’m eligible for a credit of $50. If I make up to 5 trades in 45 days then I’ll receive $150. I figured this was a good enough reason to open an account and try it out. The YOC for my Dow 30 Motif is currently around 2.3%. I think this is a great way to get additional diversification and add to a lot of companies at once even if you don’t have a huge budget. I may eventually look at adding a basket of bonds or growth stocks. I’ll be sure and share any other Motif purchases or ideas I have. That is a pretty cool concept. The DJIA typically replaces components every few years. Will you adjust the companies as needed? I also wonder if it might be more tax and fee efficient just to buy the DIA etf with a .17% fee. I really do love the DOW stocks and tend to focus on the higher yielding components. 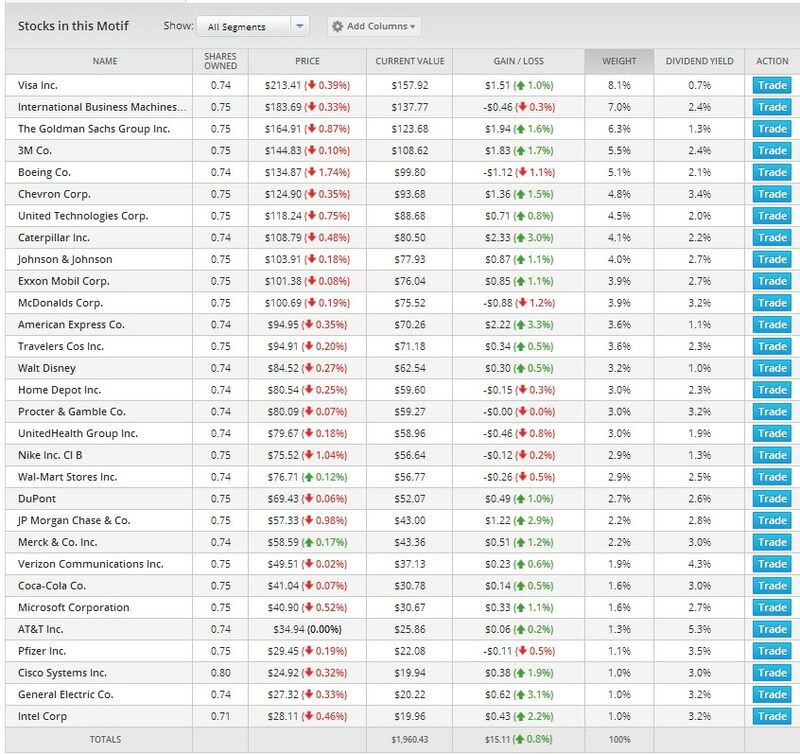 I noticed because of the price weighting your bottom five stocks T, PFE, GE, CSCO, and INTC were also the Small Dogs (5 lowest price of the 10 highest yielders) of the Dow for 2014. These have been pretty good performers for me this year….well except for Pfizer but I’m hopeful for the rest of the year. I haven’t decided if I’ll continue to replace the components and adjust the weights for each purchase. I will have to do more research and come up with my long-term strategy for this. That’s impossible to answer about the DIA etf without knowing how long I hold these stocks and how much I purchase before selling any of them. Let’s assume I bought $100k worth of DOW stocks versus $100k in an etf. Well .17% of $100k is $170 per year. Plus the lost compounding of that $170 per year which you could use to buy more stocks which would result in even bigger savings. I figure if these stocks are held for a long period of time (10+ years) before I sell off 30-40 stocks that had been in the DOW then I should come out way ahead on fees. Most of the stocks I plan to hold for much longer than that anyways, and hopefully don’t have to sell for a very long time. I like the idea and plan to add more to this Motif over time. Congrats on the purchase. I learnt about this motif concept just few days back and was quite interesting. With the motif option, investing in individual stocks would be cheaper compared to etf if you plan on holding the stocks for long term. Thanks and I completely agree. If kept for long periods of time then this strategy should beat an ETF. You have a nice portfolio going yourself. It’s looks like you’re doing a nice job of building a diversified income stream. I think this brokerage appeals to a lot of different types of traders. Yes, they have MLP’s, REIT’s, Bonds and even ETF’s. You can mix and match 30 of whatever you want. Thanks for stopping by. If you do sign up and give it a try be sure let me know what you end up buying in your studmuffin motif lol.